Relax, now your fresh food products can also breathe easier with our new stacking ventilation trays. These NFS listed composite trays feature dropped sides and/or ends for maximum air circulation allowing for quick drying, cooling or freezing. The interior corners are rounded preventing excess accumulation and these durable trays may be steam cleaned and continuously run through commercial dishwashers for years of service. 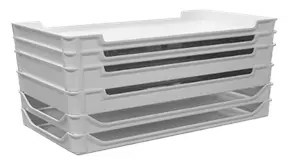 Available in four stackable depths from 2” to just over 4” and approximately 30” x 16”, these stacking ventilation trays eliminate the need for separate drying racks. An optional wheeled dolly is also available.